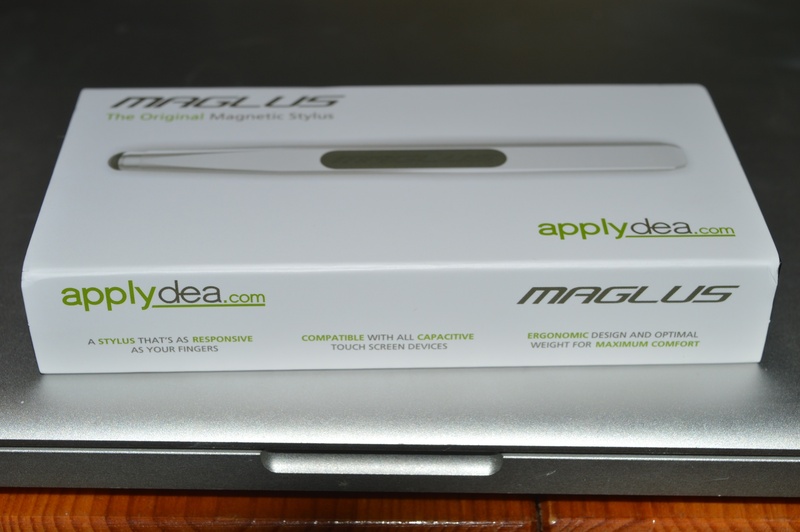 The Maglus stylus is something I purchased based upon a number of recommendations on Twitter. Previously I owned the Wacom Bamboo stylus and it was great. I had it for some time, however the nib split on it and so I was in the market for something new. One of the things I didn’t like was the size of the nib and the fact that it was so squidgy; I found it difficult to both see what I was writing and whether the nib was on the glass or not and how much pressure to exert. I have to say, so far, I’m not disappointed although like all styli, I don’t understand why none of them come with a protective lid. [two_third_last] [/two_third_last]I was tempted by the Adjonit Jot Pro stylus but with its bit of plastic on the end, but I couldn’t help but think it would be the equivalent of of trying to walk with your shoe hanging off the end of your foot. The reviews of the Maglus were exemplary, so I went for that. First up – the service from the company I bought it from on Amazon was good. The item was ordered and didn’t arrive so I contacted the company via Amazon and a new one was shipped out. No hassle. No fuss. Thank you! …I have to say it’s a nice piece of kit. It’s got a slightly funky design with a rigid non-cylindrical shape which I can see being slightly odd for some people to get used to, but I think it’s fine. The shaft itself is hard metal and so feels very sturdy in your hand. It is a quality piece of kit. It also has a strong magnet built within it too, designed to snap to your iPad for ease of carrying around. Personally, I’ll be keeping mine in my pocket inside its case or in my suit jacket breast pocket. The thickness of my iPad case means that the Maglus falls off. For owners without magnetic elements to their tablet or for iPad owners like me who have thicker cases, there is a magnetic strip sticker that comes with the stylus to enable you to stick your stylus to your tablet via the magnet. I think I’ll stick with my pocket. Example of creation with the Maglus Stylus. All in all this is a quality product. The stylus nib is stiffer than those that I have used previously. Like others the end is quite large (there really aren’t any small nib styli unless you want to draw ‘off screen’, but because it isn’t as ‘squidgy’ as many of the others, such as my old Bamboo, the feel of writing on the glass is much more smooth. You can feel and hear a distinctive tap as the nib hits the glass which is reassuring and helpful in equal measure. I can see this being used an awful lot by me and for others who use their tablet for artwork more than I ever will, I think it would be a great addition to your tablet toolkit. You can find more information on the Maglus by visiting their website here. It retails between £25-30. One thing to note: they now offer a microfiber tip that can replace your rubber tip on your current Maglus. If you haven’t done so…buy one (they were offering a free one to current owners). The microfiber tip is wonderful and I think it makes the Maglus the best overall stylus on the market.